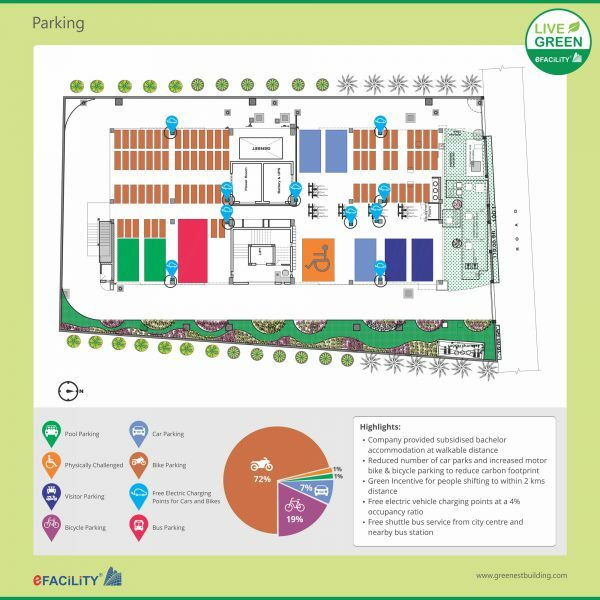 The stilt floor is the parking lot and is properly marked providing dedicated spaces for pool-parking, physically challenged, visitor parking, bicycle parking and provides free electric charging points for cars and bikes of employees covering 4% of the total occupancy capacity of the facility. SIERRA encourages usage of bicycles and in addition provides free shuttle service, the ratio of parking lots allotted is inclined towards two-wheelers and bicycles compared to cars. The ratio is 72% for two-wheelers, 19% for bicycles and a mere 7% for cars to reduce individual car usage and thereby reduce fuel use (rest goes to pool and physically challenged parking). There is a shower and changing facility available at the premises as well for the benefit of cyclers. SIERRA also provides subsidized bachelor accommodation very close to its office for almost 20% of its staff to bring the carbon footprint down.